As regular readers will know, I am a huge fan of pivot tables and find them an incredibly useful and powerful feature of Excel. If you don't know how to create a Pivot Table, take a look at my free video. For all of the power of Pivot Tables, sometimes the final format is not want you want and you need to use that data elsewhere. Management Accounts are a prime example of this - a pivot table can give you the numbers but you usually want these to then populate an ordinary Excel template, set out in your Management Accounts format. This is where the GETPIVOTDATA formula comes in. 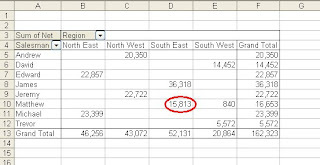 Name of data field to return is a text field, being the name of the pivot table field as it appears on the pivot table. location of pivot table is a reference to a cell anywhere within the pivot table, it is often best to use the top left cell of the main body of the pivot table, as this will remain in a constant position no matter how much the data changes. field1, item1,field2,item2,etc. are pairs of field and item names from the row, column or page (filter) areas of the pivot table. You can use as many pairs as you like. The field name comes from the original column heading in the data, the item name is the entry in that column that creates a unique row, column or page in the pivot table. This is useful when you are wanting to report one number, however you can really make use of this formula when you realise that any of the text arguments (in inverted commas) can be replaced with references to cells where the text can be found. You can then use this to populate any report layout, but I will leave this for a later post. Well spotted, thanks. This post has been read 1,935 times and you're the first to spot that. I'll change it now - or at least the first to tell me!